The White House is taking a closer look at the role of religion in its campaign against violent extremism in the Middle East. In a speech last week laced with references to religion, President Obama called on Muslim leaders and youth alike to reject the barbaric ideologies of extremist groups like the Islamic State. "All religions have been attacked by extremists from within at some point," Obama said in an address to the United Nations General Assembly. "And all people of faith have a responsibility to lift up the value at the heart of all religion: Do unto thy neighbor as you would have done unto you." Obama provided examples of religious leaders engaged in the ideological fight against extremism, quoting a Muslim sheikh who said, "We must declare war on war, so the outcome will be peace upon peace." That sheikh is Abdullah bin Bayyah, a 79-year-old cleric who, even though lauded on the world stage for his recent efforts at peacemaking, is dogged by controversy over connections to the Muslim Brotherhood. On Friday, bin Bayyah spoke about the role of religious leaders in calming conflict. He considers his role distinct from those of politicians or the military: politicians concern themselves with interests of the state and the military with weapons, while religious leaders, he said, are concerned with the internal affairs of people. "In this context, there's a huge responsibility that religious leadership has," bin Bayyah said through a translator. "It's the responsibility of a physician, really, because if you look at our civilizations, particularly now in the Middle East, they're not well—they're sick." Bin Bayyah's work is very personal, he says. "Primarily, this is a treatment that addresses the intellect, the heart, and the emotions." Bin Bayyah's focus on the human side of conflict echoes the words of world leaders at the U.N. Obama spoke of addressing the root causes of unrest in his Wednesday speech, promising to "expand our programs to support entrepreneurship, civil society, education and youth—because, ultimately, these investments are the best antidote to violence." And Iranian President Hassan Rouhani, leader of a country with which the U.S. disagrees on almost everything, spoke of the same effort at the U.N. on Thursday. He vowed to address factors driving Muslims toward extremism, such as "poverty, unemployment, discrimination, humiliation, and injustice." Bin Bayyah, in his role as a religious scholar, seeks to educate Muslims about the fallacy of extremist groups' religious ideology. Those who leave home to join extremist groups have a misguided conception of Islam, he says. "It's out of religious ignorance that they're doing what they're doing. They have a very shallow understanding." One way bin Bayyah seeks to educate his followers is by issuing fatwas, or religious edicts. In these edicts, Muslim clerics deliver opinions on pertinent questions and back them up with religious reasoning, setting a precedent and example for other Muslims. 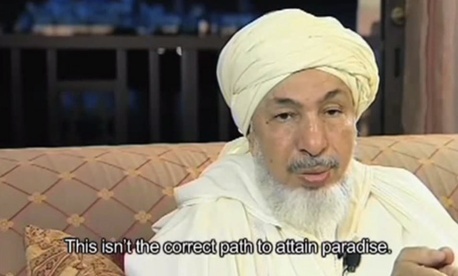 In a fatwa earlier this month entitled "This Is Not the Path to Paradise," bin Bayyah condemned the co-optation of Islamic values by extremist groups like the so-called Islamic State, and the violent acts they perpetrate. "We have to put forward intelligent responses and correct misunderstandings," he said on Friday. Bin Bayyah has previously met with staff of the National Security Council at the White House, where he discussed his efforts to counter al-Qaida's violent messaging in the Middle East. Some of the sheikh's connections to other scholars' less savory fatwas, however, have gotten him into trouble. Bin Bayyah was for nine years vice president of the International Union of Muslim Scholars, a group founded by Yusuf al-Quradawi, who has ties to the Muslim Brotherhood in Egypt. The IUMS issued a fatwa in 2004 that called for Muslims to resist the U.S. invasion in Iraq, and in 2009 issued another condemning Israel. Bin Bayyah resigned from the Union in 2013. In 2010, bin Bayyah spoke out against another scholar's fatwa that had been used to justify Qaida violence. "Anyone who seeks support from this fatwa for killing Muslims or non-Muslims," he said then, "has erred in his interpretation and has misapplied the revealed texts." On Friday, the sheikh was asked whether he was comfortable with his message ending up in President Obama's speech to the U.N. "I'm not a speechwriter for Obama," bin Bayyah deadpanned. "That he mentioned something that I said that I think is right—I'm comfortable with that."